Background: Ethiopia is one of the countries with the highest burden of undernutrition, with rates of stunting and underweight as high as 40% and 25%, respectively. National efforts are underway for an accelerated reduction of undernutrition by the year 2030. However, for this to occur, understanding the spatial variations in the distribution of undernutrition on a varying geographic scale, and its determinants will contribute a quite a bit to enhance planning and implementing nutrition intervention programmes. 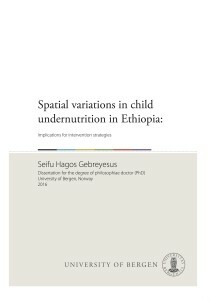 Objectives: The aim of this thesis was to evaluate the large- and small-scale spatial variations in the distribution of undernutrition indicators, the underlying processes and the factors responsible for the observed spatial variations. Methods: We used nationally available climate and undernutrition data to evaluate the macro-scale spatial pattern of undernutrition and its determinants. We applied a panel study design, and evaluated the effect of growing seasonal rainfall and temperature variability on the macro-scale spatial variations (Paper I). We conducted a repeated cross- sectional survey to assess the performance of the Household Food Insecurity Access Scale (HFIAS) developed internationally to measure household food insecurity. The results from this validation work were used to modify the HFIAS items for subsequent papers (Papers III and IV). We conducted a census on six randomly selected kebeles to evaluate the spatial patterns of undernutrition on a smaller scale (Paper III). For Paper IV, we conducted a cross-sectional survey on a representative sample, and employed a Bayesian geo-statistical model to help identify the risk factors for stunting, thereby accounting for the spatial structure (spatial dependency) of the data. Results: In Paper I, we demonstrated spatial variations in the distribution of stunting across administrative zones in the country, which could be explained in part by rainfall. However, the models poorly explained the variation in stunting within an administrative zone during the study period. We indicated that a single model for all agro-ecologic zones may not be appropriate. In Paper II, we showed that the internal consistency of the HFIAS’ tools, as measured by Cronbach’s alpha, was adequate. We observed a lack of reproducibility in HFIAS score among rural households. Therefore, we modified the HFAIS tool, and used it for subsequent surveys in this thesis (Papers III and IV). In Paper III, spatial clustering on a smaller scale (within a kebele) was found for wasting and severe wasting. Spatial clustering on a higher scale (inter-kebele) was found for stunting and severe stunting. Children found within the identified cluster were 1.5 times more at risk of stunting, and nearly five times more at risk of wasting, than children residing outside this cluster. In Paper IV, we found a significant spatial heterogeneity in the distribution of stunting in the district. Using both the local Anselin Moran’s I (LISA) and the scan statistics, we identified statistically significant clusters of high value (hotspots) and a most likely significant cluster for stunting in the eastern part of the district. We found that the risk of stunting was higher among boys, children whose mother or guardian had no education and children who lived in a food-insecure household. We showed that including a spatial component (spatial structure of the data) into the Bayesian model improved the model fit compared with the model without this spatial component. Conclusion: We demonstrated that stunting and wasting exhibited a spatial heterogeneity, both on a large and small scale, rather than being distributed randomly. We demonstrated that there is a tendency for undernourished cases (stunting and wasting) to occur near each other than to occur homogeneously. We demonstrated a micro-level spatial variation in risk and vulnerability to undernutrition in a district with a high burden of undernutrition. Identifying such areas where a population at risk lives is central in assisting a geographical targeting of intervention. We recommend further study, possibly using a trial design or implementation research approach, to help evaluate the feasibility and benefits of geographically targeting nutritional interventions. This entry was posted in Malnutrition, Research Training, Thesis writing, Universities by Bernt Lindtjørn. Bookmark the permalink.